The Milwaukee Fuel chainsaw slides out of the box ready to rip. Almost. You’ll need to charge the battery, and while it’s charging, fill the onboard reservoir with some good-quality chain bar oil. The cap has a big knob that’s easy to grab and turn, and it seals well. 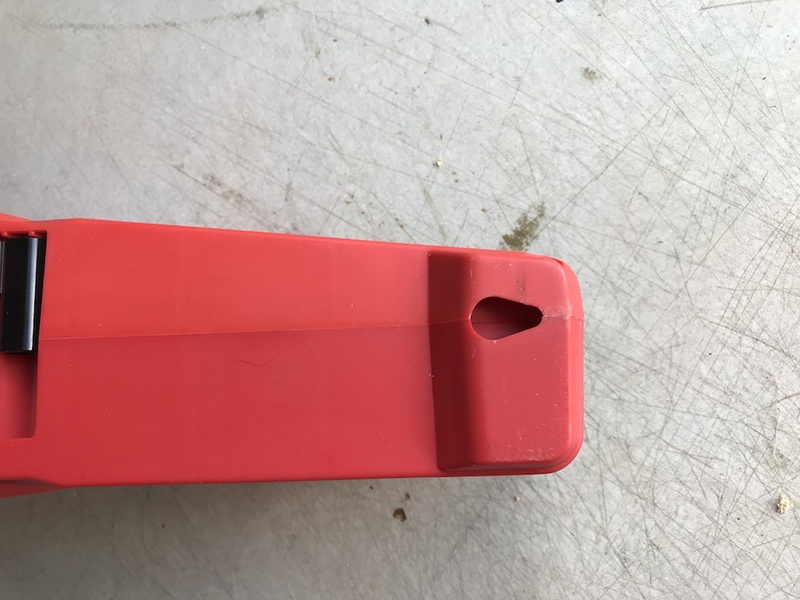 It’s also a good idea to check the two nuts that hold the guide bar in place, and make sure they’re securely snugged up, and that the chain is snug in the track but not overly tight. 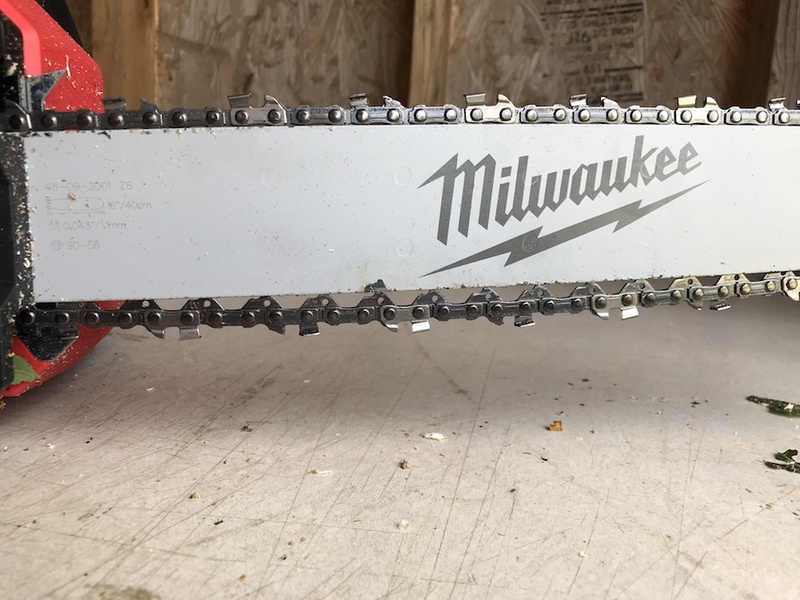 Once the reservoir is filled, Milwaukee recommends running the saw for 30 seconds, to make sure the chain gets well lubed. A funnel helps get most of the oil on the INSIDE. Make sure the chain bar retention nuts are good and tight. Like most chainsaws, the Milwaukee Fuel chainsaw is designed for right-handed use only. Hey, don’t blame me – that’s the price you pay for being different (and as my left-handed wife contends, smarter and better). The saw has good ergonomics, and it’s comfortable to hold and cut with. There’s plenty of room to grab the handles, even with gloves. 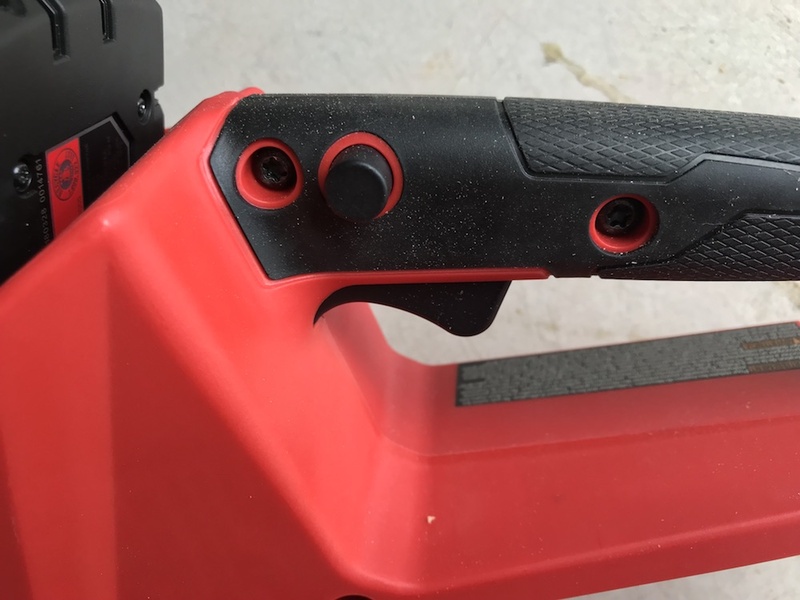 A nice touch is the keyhole slot on the back, in case you want to hang the saw on the wall of your shed or tool trailer. A keyhole hanging slot makes it easy to hang it up at day’s end. Before you can depress the trigger, you have to press in the little thumb safety. 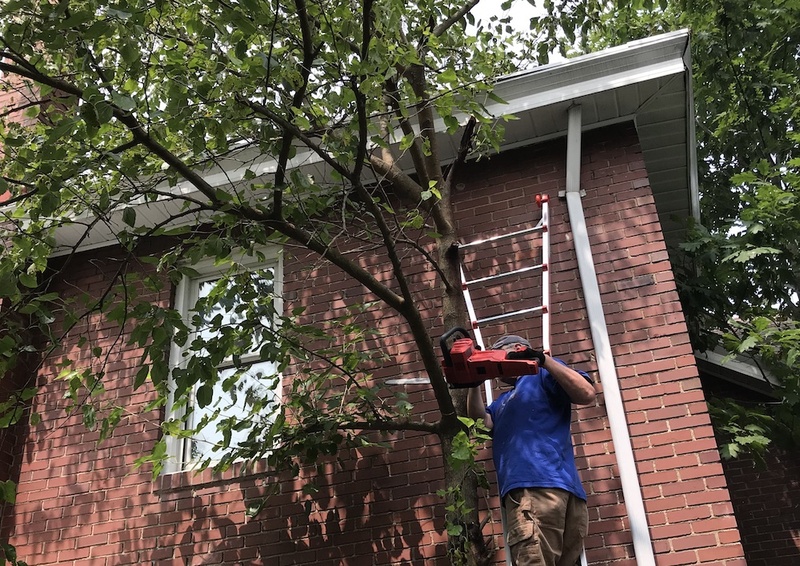 It’s not hard to do, and it’s an absolute necessity on a tool where the trigger is inside the handle, and pulling it activates a rapidly spinning chain covered with numerous sharp little blades capable of cutting through a 15” tree. I’m fine with the thumb safety. The thumb safety is easy to use. WAY easier than a trip to the ER. 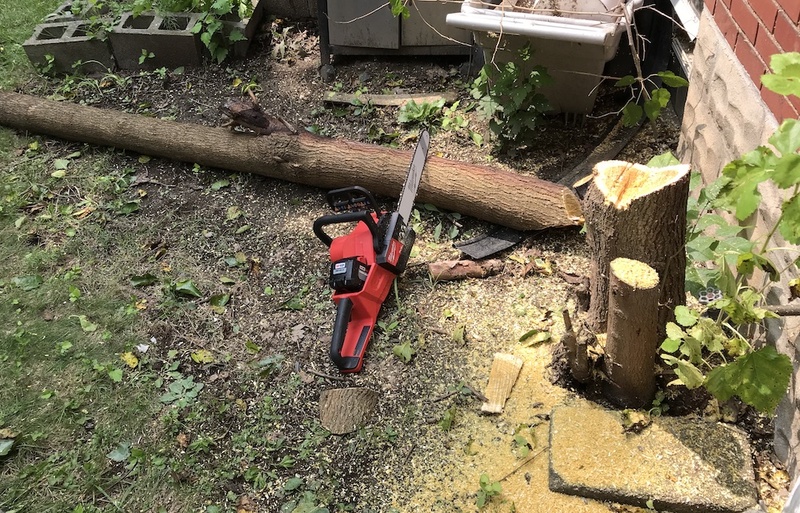 Because the Milwaukee Fuel chainsaw is powered by a battery, you might be tempted to take fewer precautions when using it than you would with a gas-powered saw. Let me assure you: If you are intent on being careless or lazy, the Milwaukee is capable of maiming you just as effectively as a gas-powered saw. Am I trying to scare you? YES! 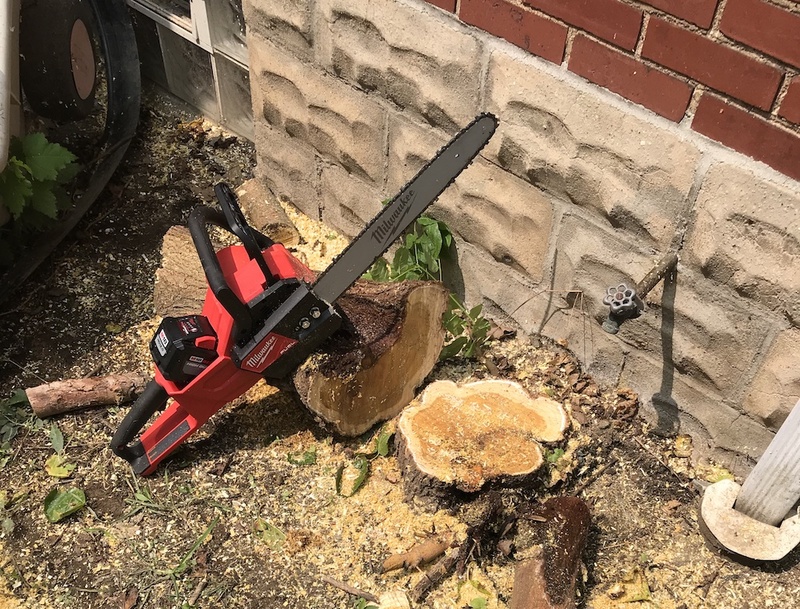 Even though Milwaukee has done everything possible to make the Milwaukee Fuel chainsaw safe to use, it’s still a tool with a rapidly rotating blade capable of cutting quickly through wood. Chainsaws are an inherently dangerous category of tools. 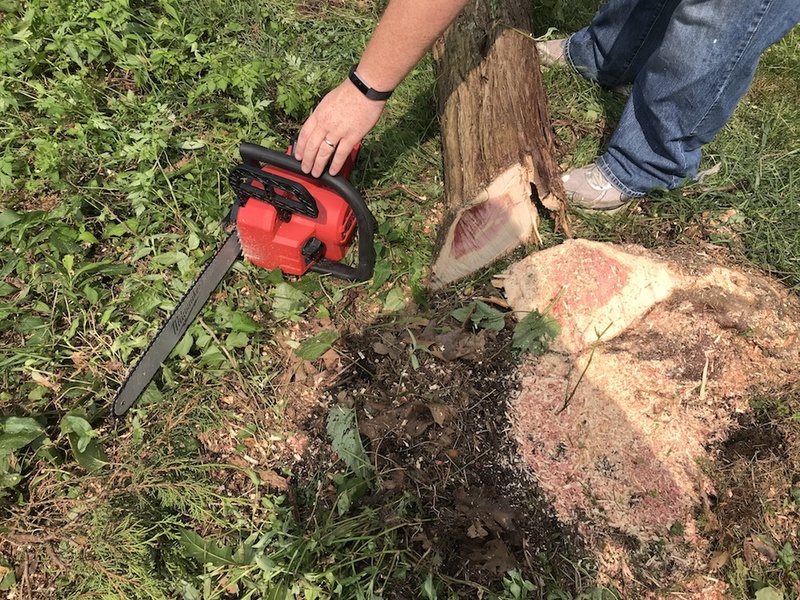 Regardless of the size of your chainsawing task, we highly recommend wearing full PPE including protective chaps (these are typically lined with kevlar to reduce the risk of a potentially fatal cut to a leg), hearing protection, and a helmet with face/brush shield. Milwaukee has incorporated several safety features into the Milwaukee Fuel chainsaw. To maximize the chances your lumberjacking experience will be safe and smooth, the saw comes equipped with a low-kickback chain. This chain helps minimize the force of any kickback, by preventing the cutting teeth from digging in too deeply in the kickback zone (near the tip of the bar). 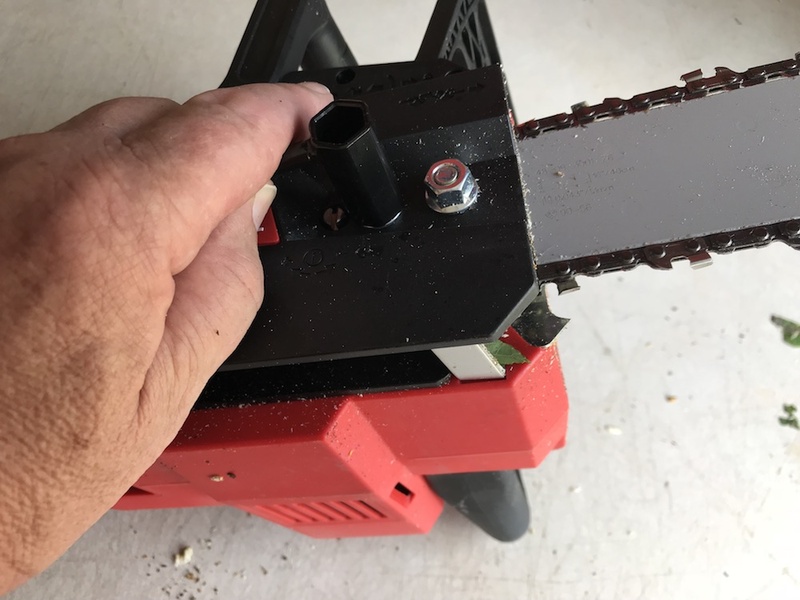 If the saw does kick back, the chain brake, located forward of the front handle, can help prevent the saw from carving grooves in places you don’t want them by stopping the chain almost immediately. When cutting with the saw, the chain stops very quickly when the trigger is released, going from full speed to a full stop in under two seconds. 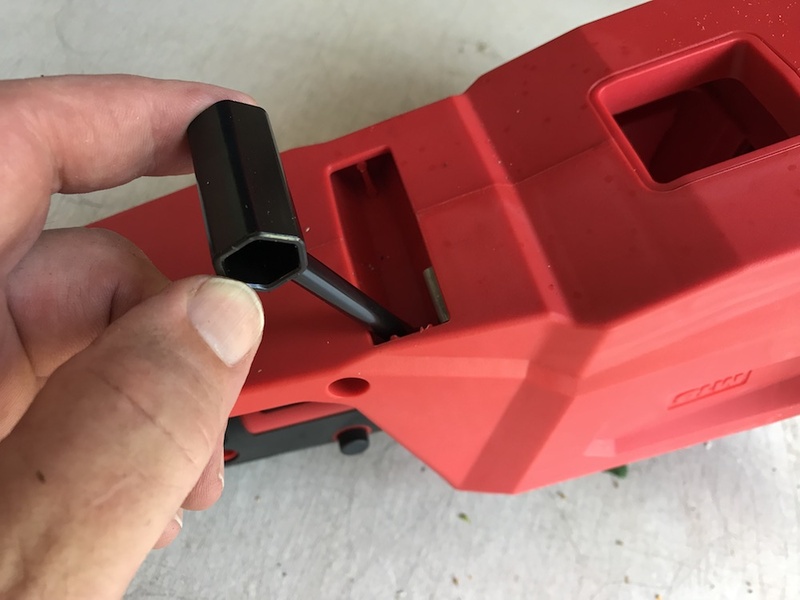 And here’s a special HF tip for you: If the saw suddenly stops responding to the trigger, make sure the brake didn’t get accidentally engaged. If it did, the motor won’t run. The brake is ON when it’s pushed forward, toward the business end of the saw. 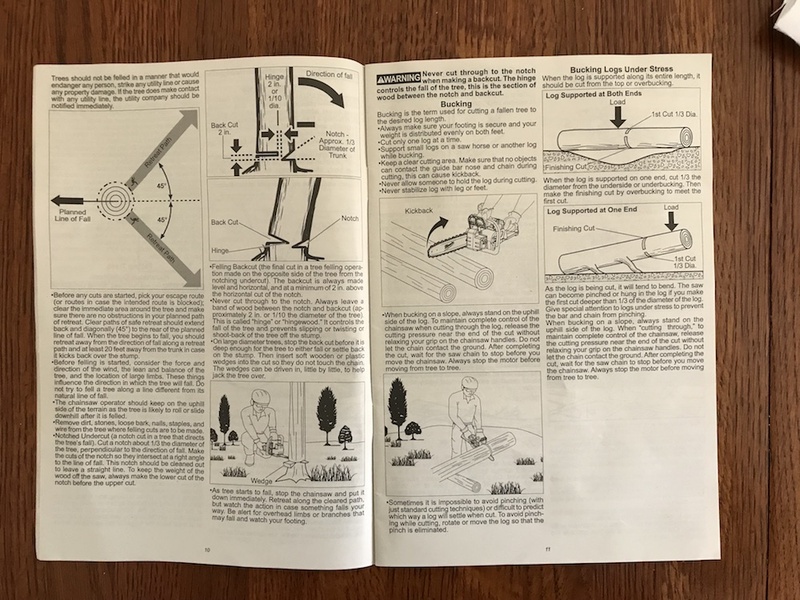 Realizing that a powerful battery-powered saw was likely to be as appealing to buyers with little or no chainsaw experience as it is to pros, Milwaukee included a good bit of helpful tutorial information in the manual for the Milwaukee Fuel chainsaw. There are pictures and descriptions of how to use the saw for limbing, cutting down a tree, and bucking up trees in various positions. We strongly recommend investing a few minutes to RTFM (read the fantastic manual). The tutorial info is bolstered by a good deal of helpful safety information. Although I frequently blow off reading product manuals, I think this section is well worth investing a few minutes to read, for newbies and experienced users alike. 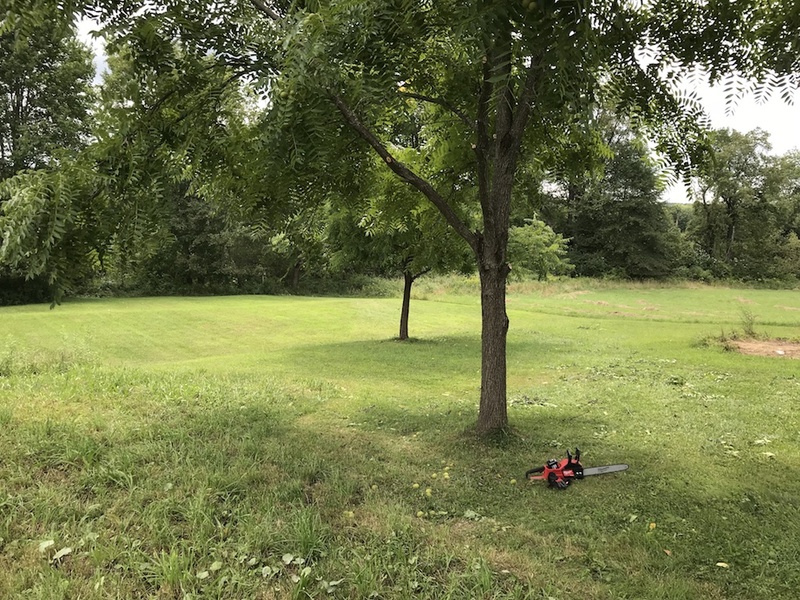 We have a 25-acre farm in northwestern Pennsylvania, bordered by woods on one side and across the back. We also have several trees scattered around the house and beyond the garage. 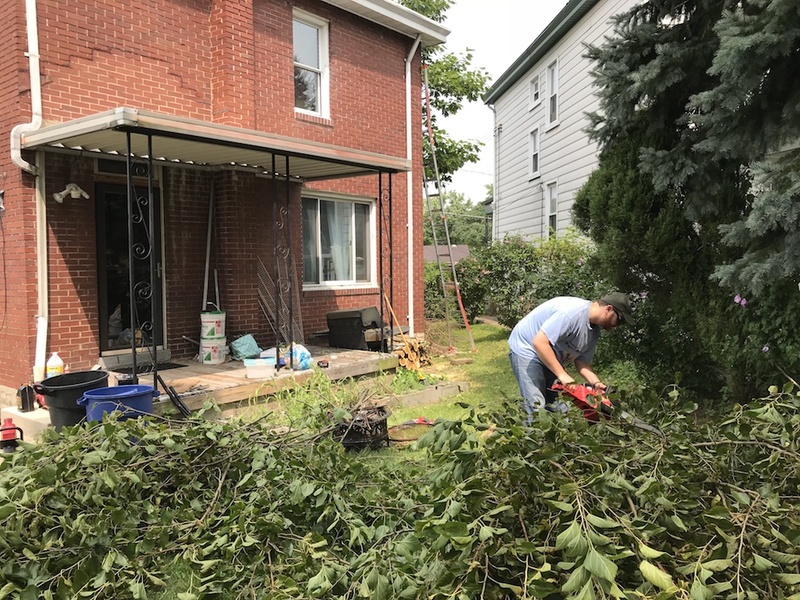 There are always at least a couple of trees that need pruning, and every so often one that needs to come down, either because it’s damaged or because we need firewood. 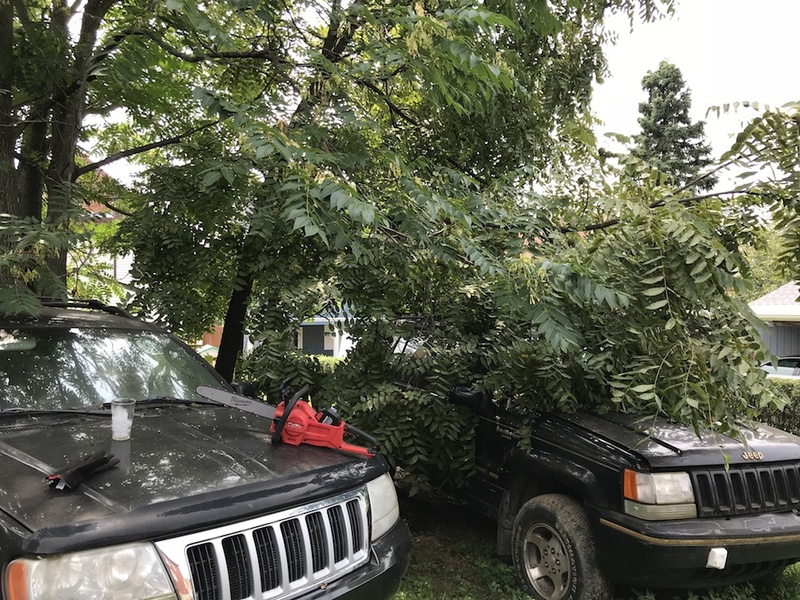 We’re well set for firewood at the moment, but a couple of our walnut trees were in need of a little sharp-edged discipline. This seemed like a perfect opportunity for the Milwaukee Fuel chainsaw to cut its teeth. And his partner was making it tough to mow. I topped off the charge on the beefy HD12.0 Ah High Output battery, and filled the chain bar oil reservoir. The chain was perfectly tensioned out of the box, and the nuts holding the bar on were good and snug. 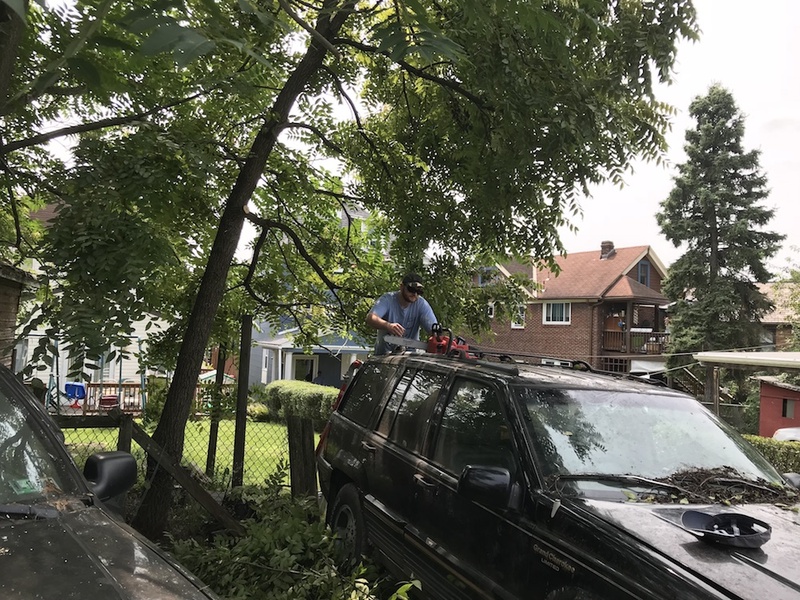 I ducked under the low-hanging limbs, and started trimming. It’s often the case that we get great happiness or satisfaction from the little things in life. 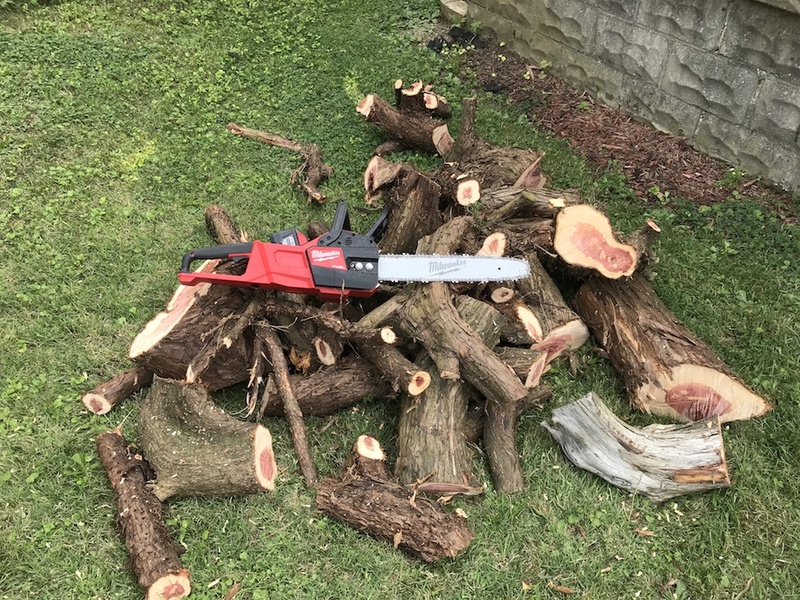 This is certainly the case with a brand-new chainsaw blade; the teeth on the Milwaukee Fuel chainsaw ripped through the limbs on the walnut tree like rabid politicians going after one another on a debate stage. Only MUCH more quietly. 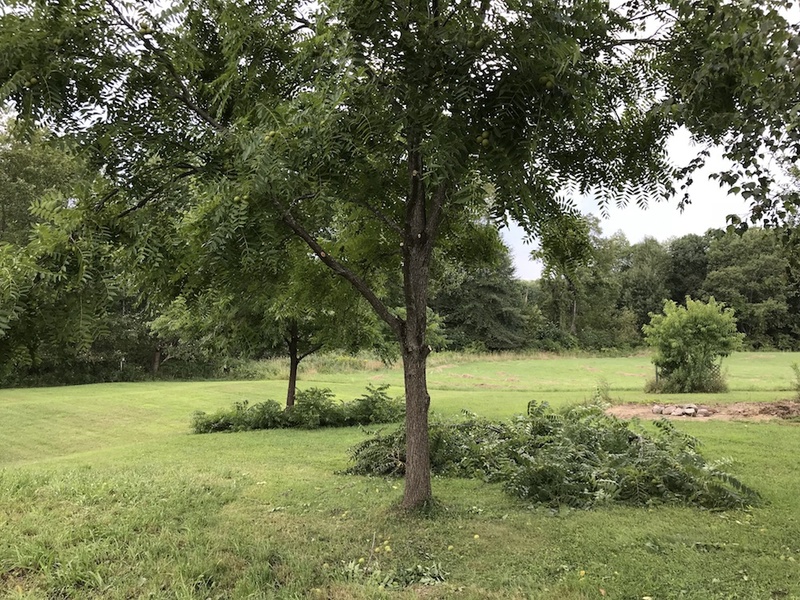 I quickly had both trees trimmed, and then it was on to the less-enjoyable part of the chore – dragging the debris into the woods. Note: After cutting about eight limbs, I noticed that the chain was drooping. (Since it was 87 degrees out, I could relate…). This is common with a new chain; it will stretch and loosen a bit when first used. I popped the scrench (screwdriver/wrench) out of its cubby, loosened the chain bar nuts, adjusted the chain tensioning screw, and re-tightened the nuts. It took about a minute, and I was good to go. Snug up the chain, then tighten everything back up. After all the limbs were down, I cut some into smaller pieces to make them easier to drag. I also cut some of the larger limbs into firewood-sized pieces – a bit of walnut is always welcome to feed the fire pit. When everything was finished, the battery charge indicator still lit up all four out of four bars. A little stack of walnut for the fire pit. Now we can cut the grass without getting knocked off the mower. 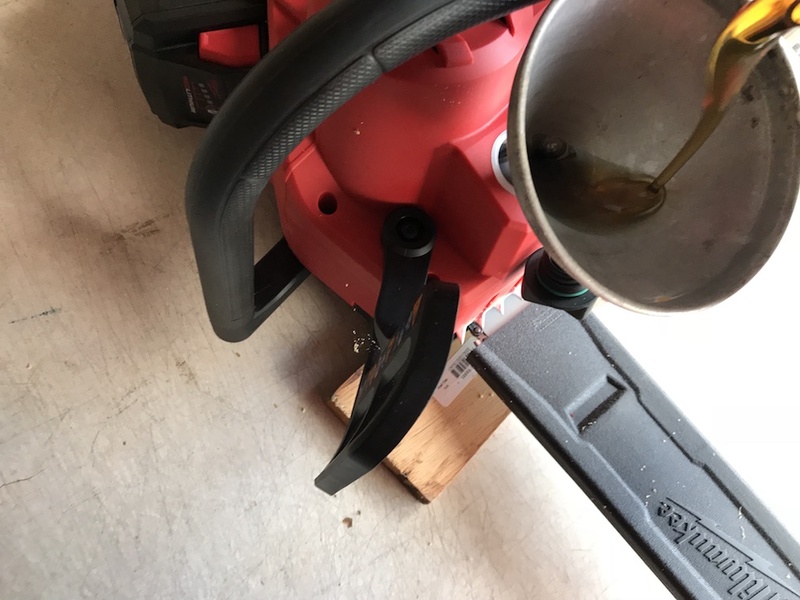 For its next mission, I took the Milwaukee Fuel chainsaw to my son’s house. He had a sapling about 8” from his house that he had ignored for a few years. When you do that, nature steps right in, and his “sapling” was now around 30’ tall. The saw and I ventured up his ladder, cutting off all the limbs along the way. 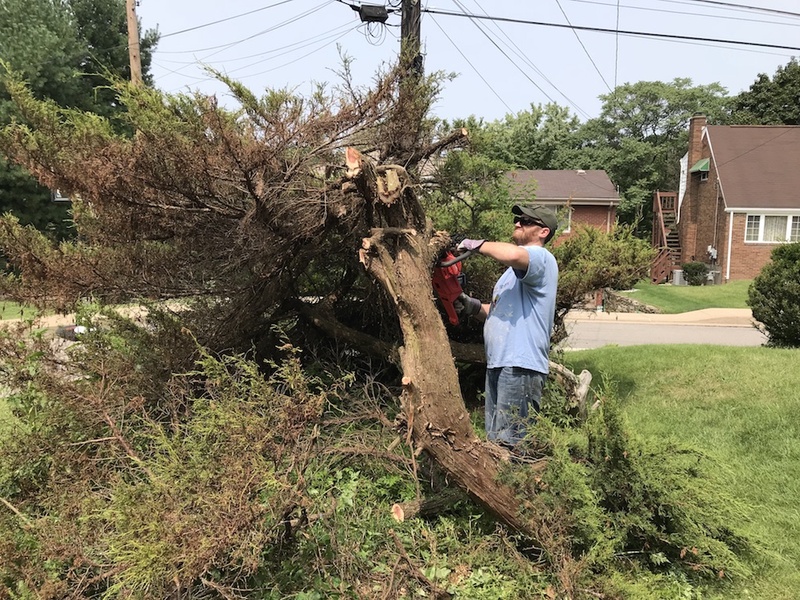 Once that was done, we dropped the rest of the tree in his back yard, and cut up all the branches into bite-size pieces to dispose of. We also bucked up all the larger pieces into firewood. And right-sized the branches for removal. He also had a couple of walnut trees that were in the process of eating his Jeeps. Notice a pattern here with walnut trees? 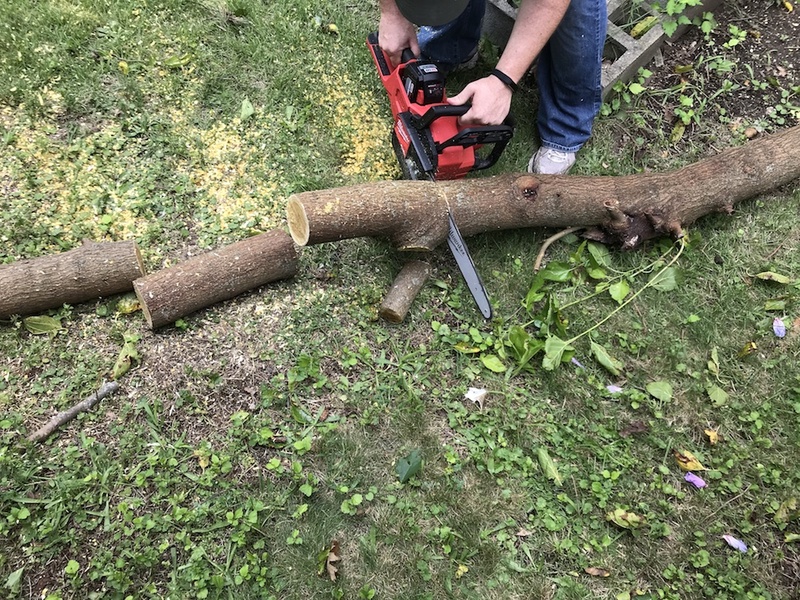 We used the Milwaukee Fuel chainsaw to give the walnut trees a good trim job, and again cut up the larger pieces into tasty chunks for his fire pit. 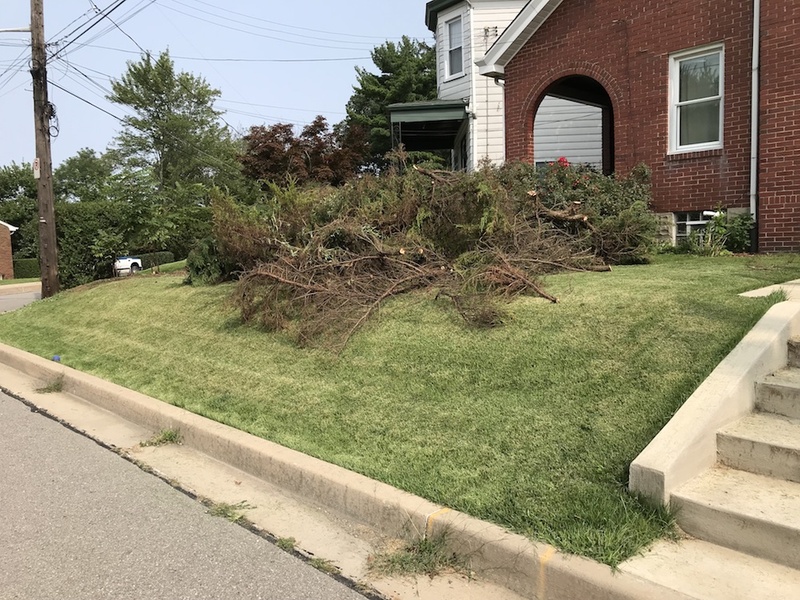 Next it was off to the front yard, where there was a tangled mass of evergreen, which was dying from an infestation of bagworms. It turns out what we thought was a bush was a tree that had fallen many years ago, and many of its branches had actually grown down into the ground and created new, very tenacious roots. Bushzilla, a luxury resort for bagworms. 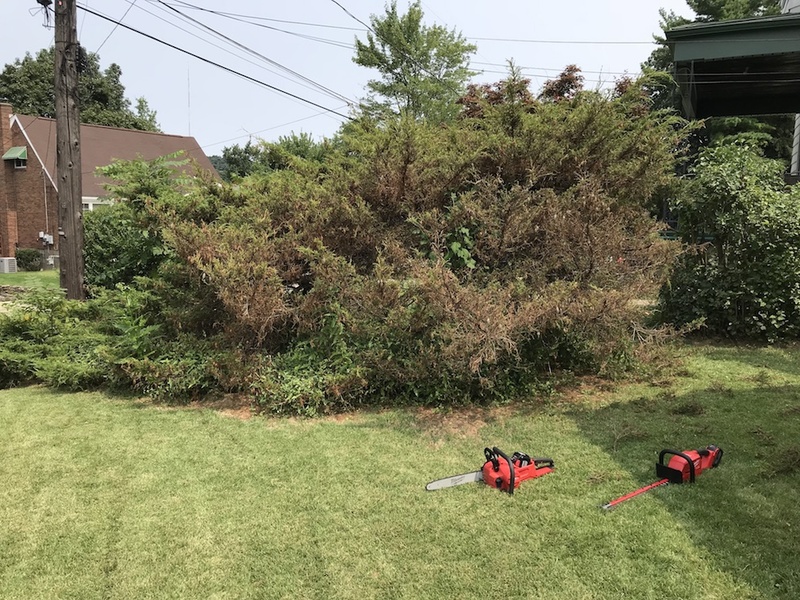 We fired up the Milwaukee Fuel chainsaw and started working our way through the tangled mess. 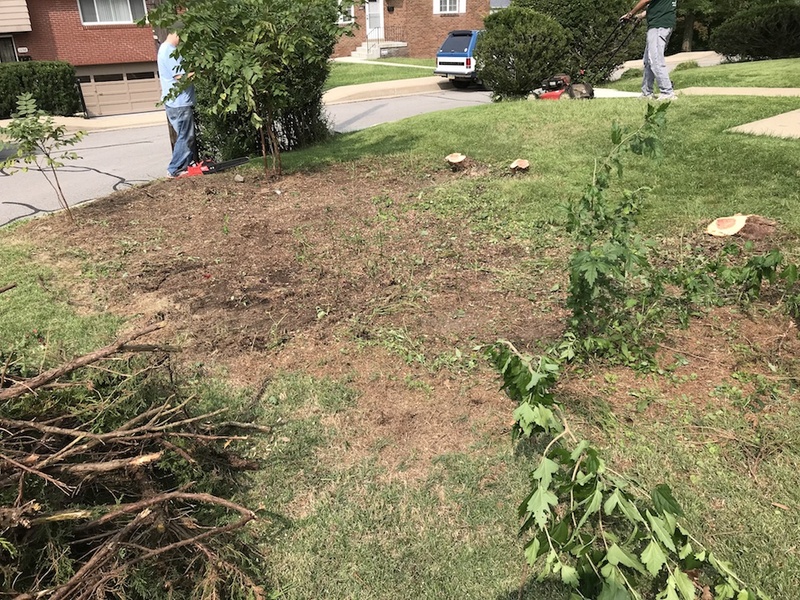 We cut and dragged out several twisted branches around 3-4” in diameter, and cleared access space around the main trunk, which was roughly 7” in diameter. 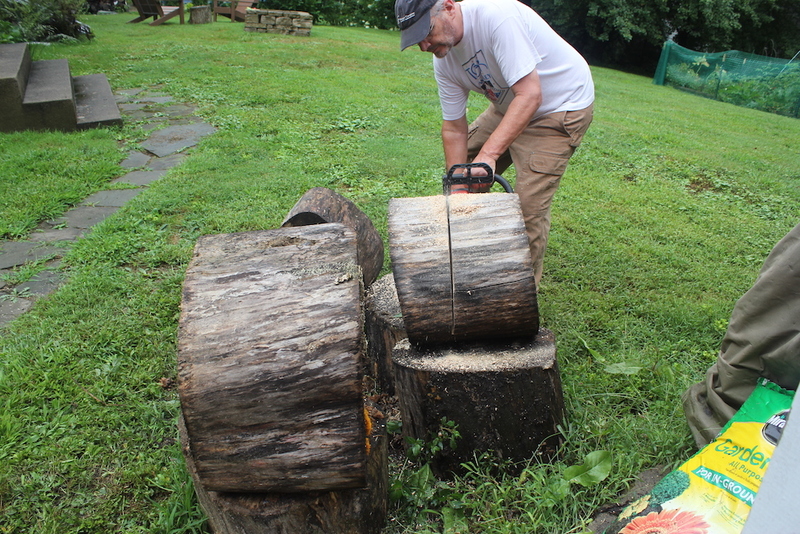 We cut it off close to the ground, and started bucking it up to remove it, as the wood was very dense and heavy. Taking down one of three main trunks. After making three cuts in the trunk, the battery decided it was time for a nap. 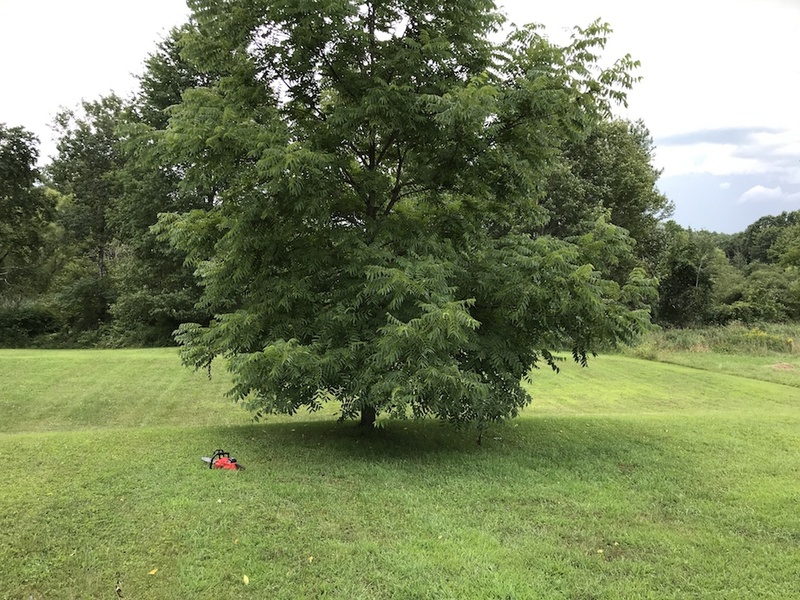 After trimming the walnut trees at our farm, I hadn’t recharged the battery, so on one charge it did those trees, took down my son’s tall tree and chunked it up, trimmed his walnut trees, and made a good start on the bush from hell. Not bad for a single battery! Part way through the “bush,” a 9.0 Ah battery took over for its big brother. We put the 12.0 Ah battery on the charger, and slid in a 9.0 Ah High Demand battery. This brought the saw right back to life, and it cut strongly through the remainder of the evergreen mess. 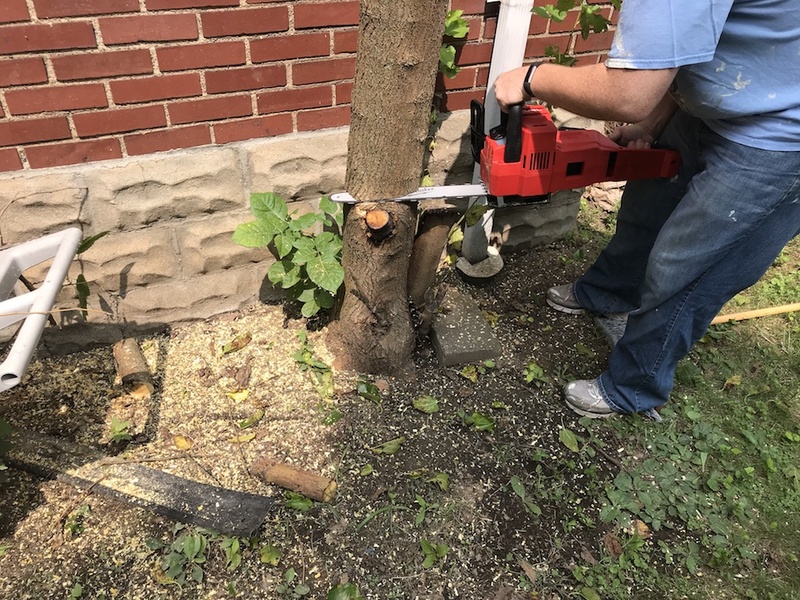 Even with the smaller battery, we had no trouble cutting through the dense, thick trunk material, and we soon had the entire monster bush removed. Once again, we cut the larger diameter branches into firepit-sized lengths. The smaller battery finished the bush, and diced up most of this pile. 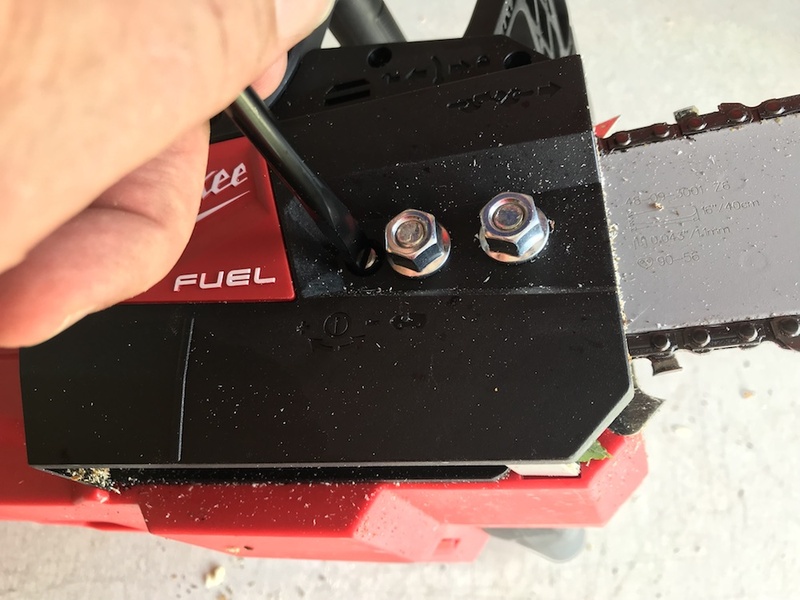 This brings up the only negative to the Milwaukee Fuel chainsaw – if you’re putting in a full day’s work, you’ll likely need more than one battery. The saw is optimized for the big 12.0 battery, but will run on lesser M18 batteries, the bigger the better. If you have a High Demand 9.0 battery, that should keep your chain spinning until the big battery is freshened up. A few feet away, however…a whopping pile of dead, infested evergreen. Make us an offer! Finally, I wanted to see how the Milwaukee Fuel chainsaw would do with some bigger stuff. I introduced it to a 20”-plus piece of solid maple, attacking it from two sides. The saw chewed steadily through, even with the bar fully buried in the wood, and never bogged down. All 20-plus inches of it. 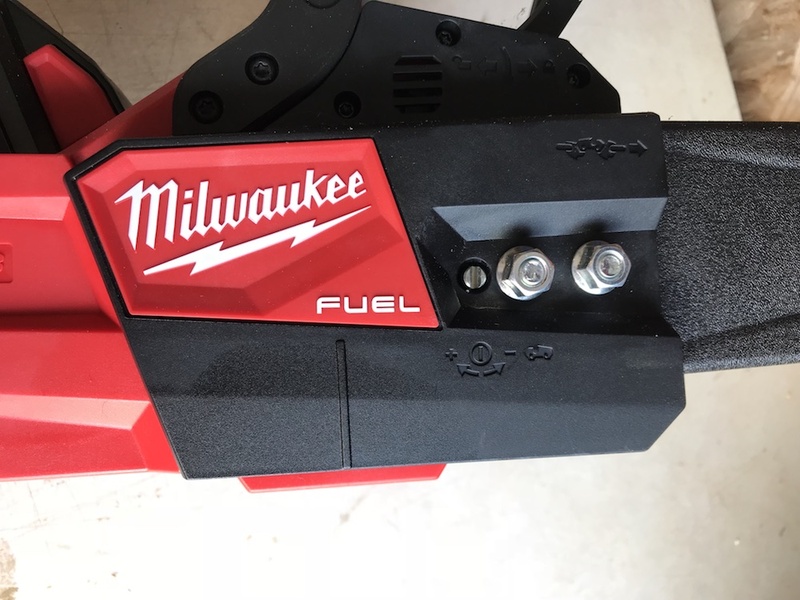 Does The Milwaukee Fuel Chainsaw Belong in Your Chain Of Tools? I am definitely NOT a tree pro – I’m nowhere near crazy enough to do this stuff for a living. I have done a lot of cutting and trimming over the years, though, and I’ve often watched the pros in action. 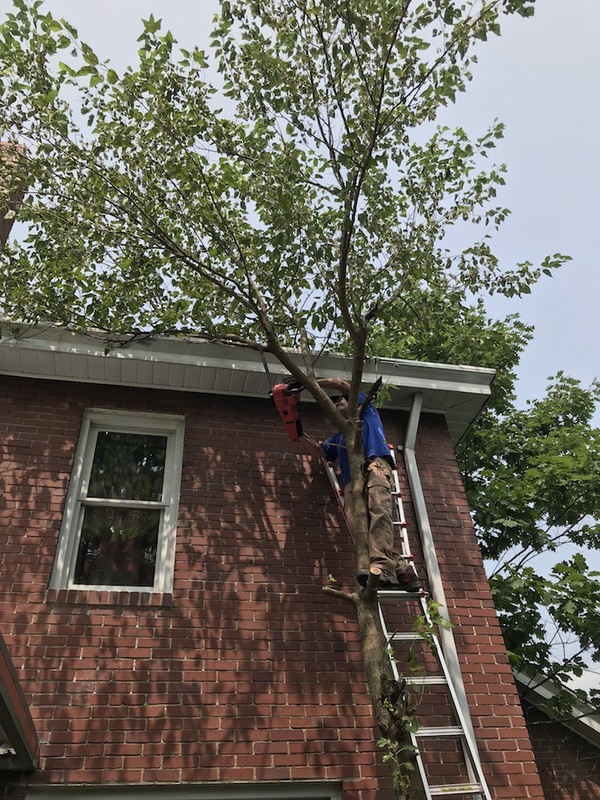 My first thought on “who would this saw be perfect for” is the guys that clamber up the tree, cutting limbs and lowering them to the ground with ropes, as they prep to bring down the trunk. 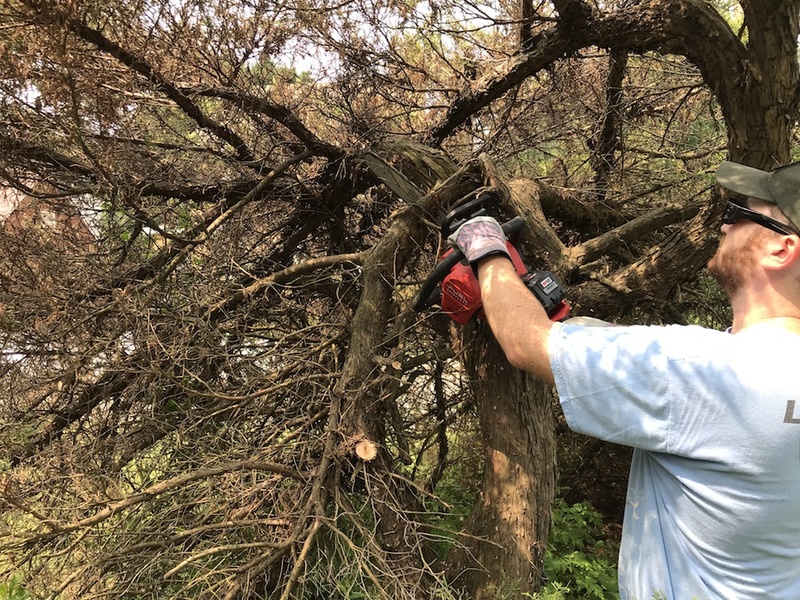 The Milwaukee Fuel chainsaw has plenty of capacity and power, and not having to yank a starter rope when you’re 40’ off the ground has to make the job a bit safer. Since the saw is so quiet, it also makes it easier to communicate with the crew on the ground. The absence of two-stroke fumes blowing in your face is pretty enjoyable, too. 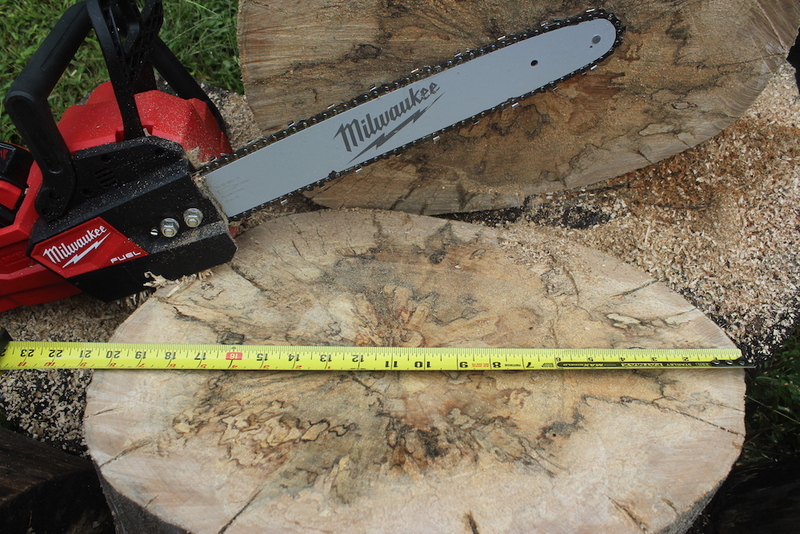 I think the Milwaukee Fuel chainsaw would be a very capable substitute for a 16″ gas saw. 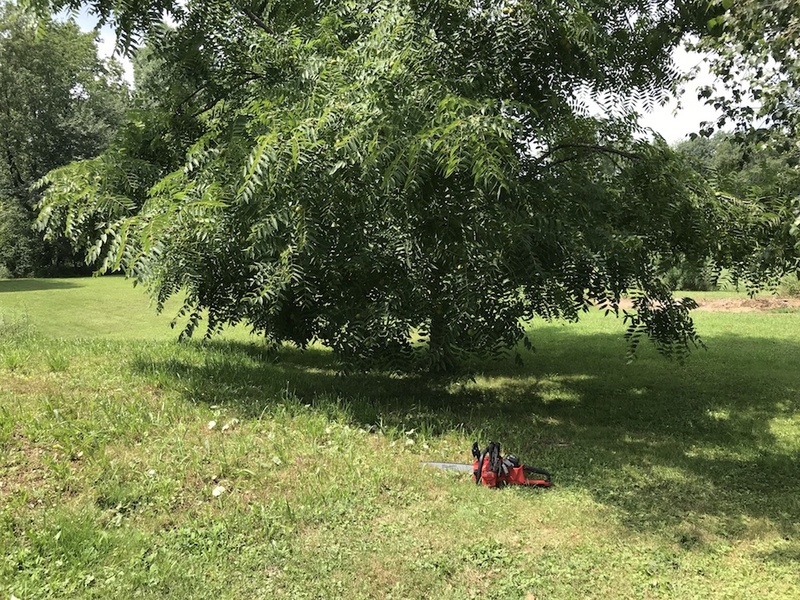 The Milwaukee Fuel chainsaw would also be a great choice for landscaping crews, who maintain and trim trees as part of their service. 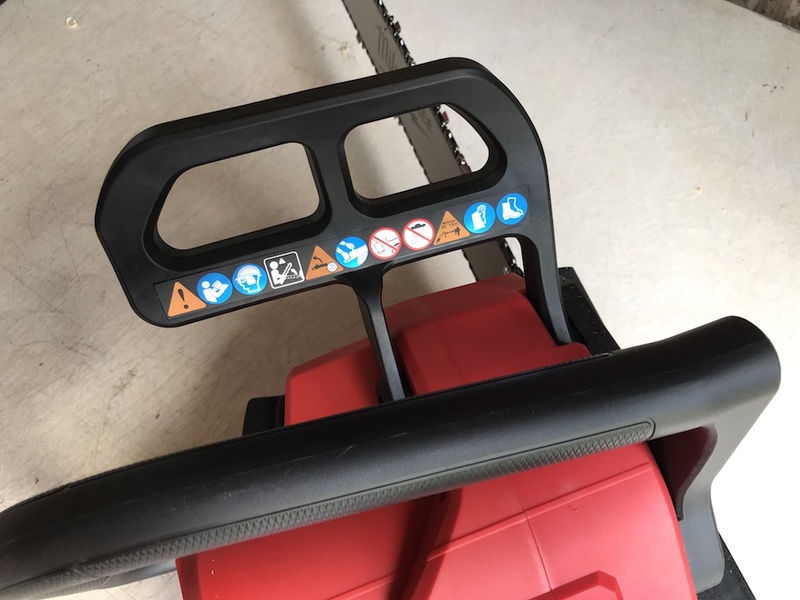 This is especially true for crews who already use some of the other Milwaukee OPE tools, such as the string trimmer, blower, and hedge trimmer, since they all use the same battery platform. And the fact that the saw is so quiet would make them MUCH more popular with the neighbors of their clientele. 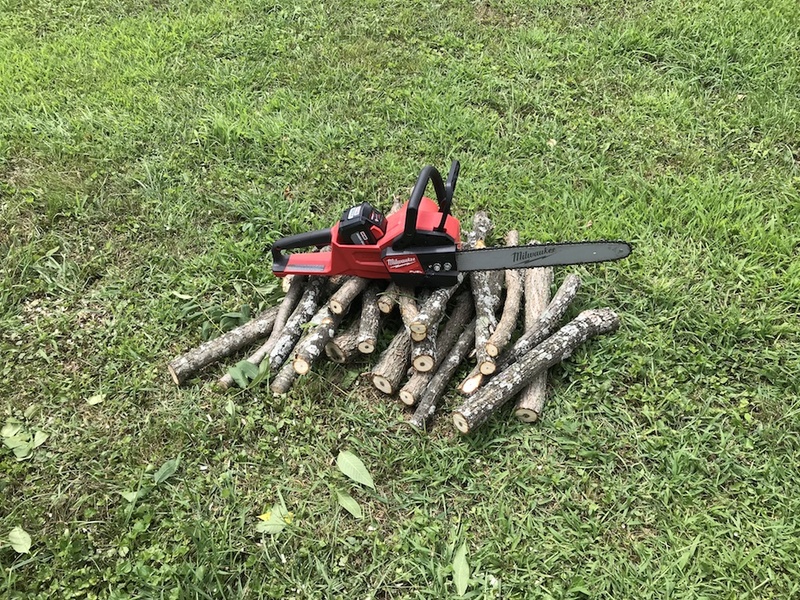 Last but certainly not least, the Milwaukee Fuel chainsaw would be an excellent choice for anyone who owns a home or acreage with trees. 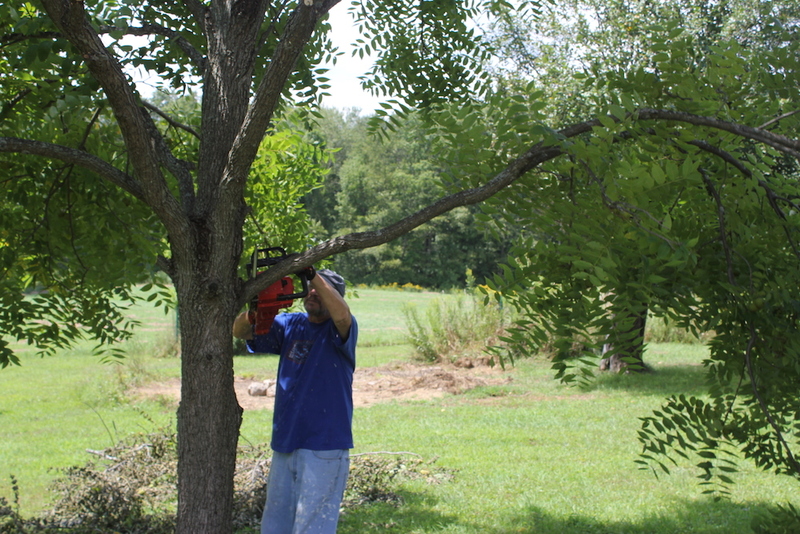 Most trees need attention from time to time to keep them healthy, and to prevent unwanted face-to-branch contact. Unfortunately, it’s a task that often gets put off, because messing with the oil/gas mix, finicky carburetors and starter ropes, and noise and fumes aren’t high on most of our “awesome ways to spend a day off” lists. The ability to slap in a battery, check the chain bar oil, and start cutting, is pretty appealing. 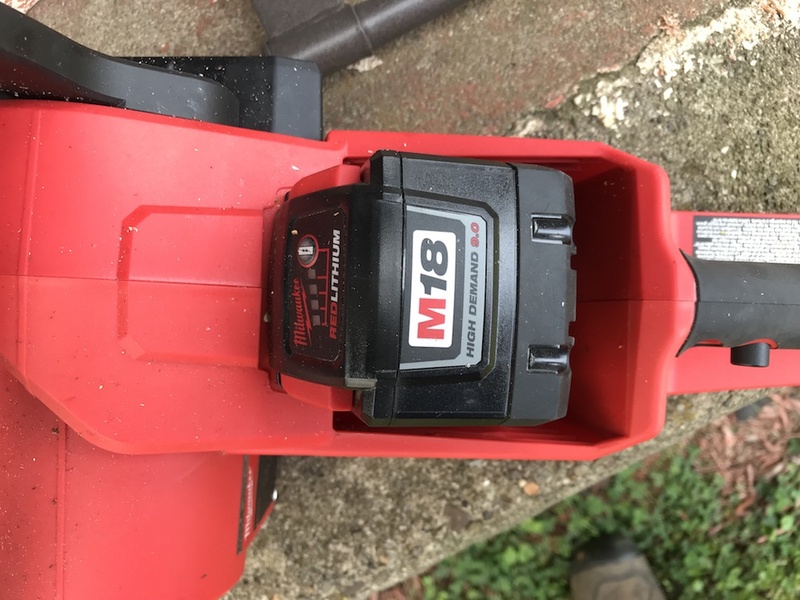 And for anyone already on the Milwaukee M18 battery platform, buying the chainsaw means you have another battery for the tool corral – and a whopping big and powerful one at that. The Milwaukee Fuel chainsaw would be great for…anyone who uses a chainsaw. The Milwaukee Fuel chainsaw is well-designed and constructed, and feels like it should hold up well. Milwaukee backs the saw with a five year warranty, and a three year warranty on the battery. Try one out, and there’s a good chance you’ll be happy to swap your gas and oil cans for a battery charger. I have used mine for about 3 months now and the only negative I have is the oiler puts out too high a volume. I checked with our contact at Milwaukee, and as I suspected, there’s no way to adjust the automatic oiler. Not sure if a Milwaukee service center could tweak it. Hopefully the amount of oil it puts out isn’t too crazy; on the bright side, your chain will be very well lubed! This saw works very well. I think most homeowners would be quite content with it. Well balanced, easy to operate safely, quiet as far as chain sees go and very smooth operation. The chain popped a couple of times on me throughout a day of operation but that was quickly corrected with the onboard tool. Overall a great Milwaukee took and a great article. Thanks for the kind words. 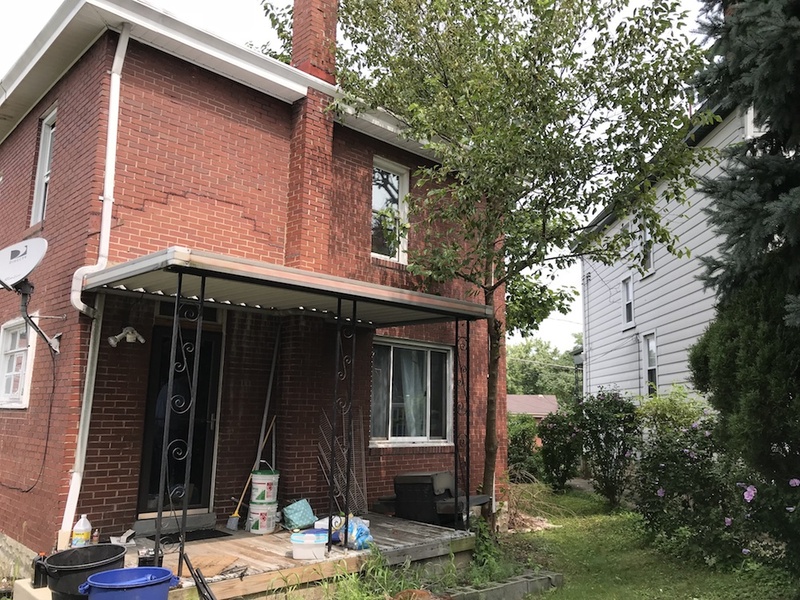 You’re right; since it’s so easy to get up and running, this would be an ideal saw for homeowners. No worries about finicky carburetors, fouled plugs, mixing gas and oil, etc. And it cuts like a champ!